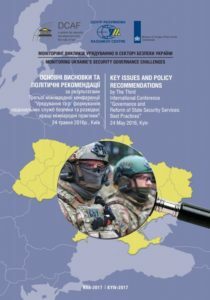 This publication offers the Key Issues and Policy Recommendations based on the results of the Third International Conference “Governance and Reform of State Security Services: Best Practices”. Conference Three – the third in a series of eight – focused exclusively on the SSU reform process; aiming to unpack the issues raised during the first two events: the SSU’s military status, pre-trial investigation powers and its oversight and accountability. Building on the findings and recommendations of the previous conferences, this Conference aimed to identify current reform priorities, discuss relevant European good practices and assess capacity development needs for intelligence governance in Ukraine.